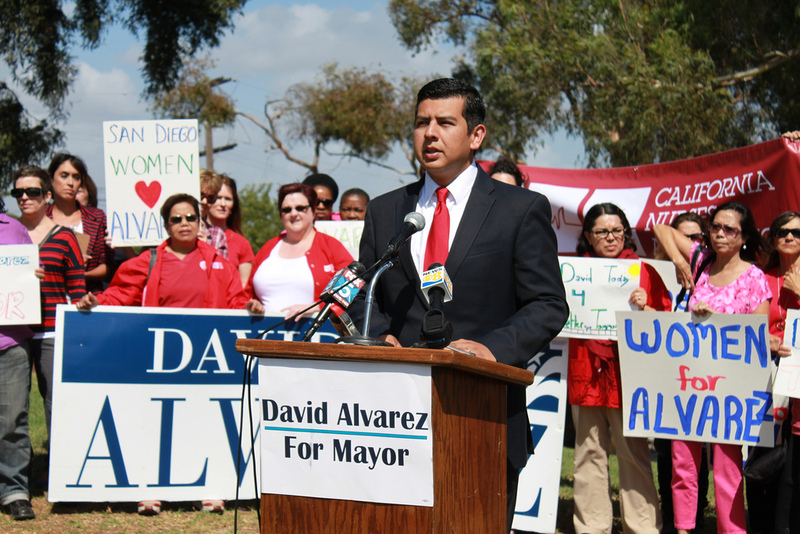 As the candidates for San Diego mayor made their final pushes for votes, Councilman David Alvarez scored an endorsement today from Gov. Jerry Brown. Mayoral candidate David Alvarez. Photo courtesy David Alvarez for Mayor. Alvarez, who rode the trolley during the morning commute to seek votes, said he was “incredibly grateful” for the governor’s support and pledged to work with him to create a stronger middle class. He has received endorsements from numerous Democratic state officials. Councilmen Kevin Faulconer told the station that a lot work and energy goes into the last two days of a campaign, so he and his supporters will be knocking on doors and making phone calls. He and his mother held signs and waved at drivers during the morning commute. A poll released Sunday showed Faulconer leading Alvarez 47 percent to 46 percent among likely voters. The SurveyUSA poll, conducted on behalf of 10News and U-T San Diego, had Faulconer up by 5 points two weeks ago. Political observers have been expecting a close race that’s likely to be decided by turnout at the city’s polling places. In the Nov. 19 special election, Alvarez was in third place when absentee ballots were counted. However, when votes from the polling places came in, he edged out former Assemblyman Nathan Fletcher for a spot on the runoff ballot. Tuesday’s winner will serve out the nearly three years remaining in the term of Bob Filner.